ROCKINGHAM – Virginia’s Daren Lotts turned back 2015 Summit Super Series Champion Jeff Parrish of Clayton in Friday’s final to claim the first $10,000 share of the purse posted for the ATI Performance Products Top ET Challenge which continued today at Rockingham Dragway. Lotts, who owns Lotts Home Furnishings and Appliance in Suarts Draft, Va., got his dragster to the finish line .01 ahead of Parrish after the two left the starting line in a dead heat. A $20,000 top prize was on the table for Saturday with a second $10,000 share available to the winner of the third race scheduled for Sunday. Sharing the Friday spotlight with Lotts was former Carolina Coalition champion Tommy Plott of Winston-Salem who won the Gamblers Race when final round foe Lenny Butcher of Howell, N.J., was guilty of a foul start by a narrow .006 of a second. Round 5 – Buddy Dial, Rowland, .013, 4.764 on a 4.750, 143.87 mph, def. Matt Cooke, Hendersonville, foul; Chip Johnson, Fayetteville, .011, 6.297 on a 6.280, 106.55 mph, def. Paul Warwick, Lumberton, .041, 8.499 on an 8.490, 102.35 mph; Shawn Carpenter, Elm City, .008, 5.922 on a 5.900, 110.25 mph, def. Mike Whitaker, Telford, Tenn., 1965 Chevy Nova, .035, 5.972 breakout on a 5.980, 114.59 mph; Tommy Plott, Winston-Salem, 1965 Ford Mustang, .022, 5.193 on a 5.170, 132.35 mph, def. John Scott, .027, 6.047 breakout on a 6.050, 114.10 mph; Daren Lotts, Waynesboro, Va., .005, 4.847 on a 4.820, 139.98 mph, def. Eric Aman, Clinton, .026, 5.834 on a 5.820, 117.10 mph; Jeff Parrish, Clayton, .012, 5.678 on a 5.540, 103.61 mph, def. 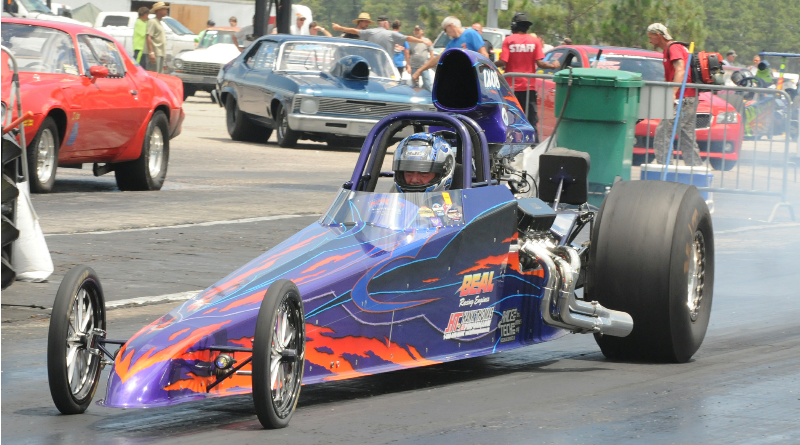 Carl Baker, North Ridgeville, Ohio, .016, 6.382 on a 4.530, 72.08 mph; Tommy Plott #2, Winston-Salem, bye. Round 6 – Carpenter, .036, 5.901 on a 5.900, 110.66 mph, def. Plott #2, .015, 4.616 breakout on a 4.620, 147.76 mph; Parrish, .011, 5.537 on a 5.530, 124.66 mph, def. Dial, .009, 4.775 on a 4.760, 143.38 mph; Lotts, bye; Johnson, .010, 6.295 on a 6.280, 108.59 mph, def. Plott, .018, 5.201 on a 5.180, 132.00 mph. Semifinals – Parrish, .022, 5.531 on a 5.530, 122.21 mph, def. Johnson, .022, 6.288 on a 6.280, 109.48 mph; Lotts, .011, 4.843 on a 4.840, 139.41 mph, def. Carpenter, .012, 5.910 on a 5.890, 109.99 mph. FINAL – Daren Lotts, Waynesboro, Va., -.002, 4.844 on a 4.830, 140.44 mph, def. Jeff Parrish, Clayton, -.002, 5.543 on a 5.520, 123.60 mph. Round 4 – John Mayers, 1996 Chevy S10 truck, .001, 6.319 on a 6.270, 108.16 mph, def. Jimmy Broadway, Vanceboro, .072, 6.006 on a 5.990, 112.49 mph; Tommy Plott, Winston-Salem, .018, 4.594 on a 4.600, 149.53 mph, def. Jake Woodring, Lenoir, foul (-.002); Daniel Woodruff, Battleboro, 1968 Chevy Camaro, .021, 6.172 on a 6.150, 111.45 mph, def. Colby Fuller, Savannah, Ga., .025, 4.984 on a 4.950, 137.96 mph; Lenny Butcher, Howell, N.J., .042, 4.638 on a 4.650, 146.45 mph, def. E.J. Womack, Lillington, .007, 6.261 breakout on a 6.280, 108.76 mph; Paul Warwick, Lumberton, .004, 6.477 on a 6.470, 104.50 mph, def. A.J. Currie, Godwin, foul (-.004); T.G. Paschal, McLeansville, .004, 4.519 on a 4.510, 151.61 mph, def. Josh Duggins, Inman, S.C., .018, 4.447 on a 4.440, 154.35 mph; Jerry Brewer, Lumberton, .024, 4.647 on a 4.640, 147.05 mph, def. Tannor Gray, Hope Mills, 1974 Chevy Camaro, .022, 6.605 on a 6.590, 101.83 mph; Jamie Freeman, Westville, S.C., 1985 Pontiac Firebird, bye. Round 5 – Plott, .015, 4.600 on a 4.590, 146.11 mph, def. Woodruff, .025, 6.184 on a 6.160, 113.41 mph; Butcher, .001, 4.672 on a 4.640, 13.47 mph, def. Mayers, .044, 6.304 on a 6.290, 107.79 mph; Brewer, .012, 4.645 on a 4.640, 148.17 mph, def. Paschal, .008, 4.523 on a 4.510, 151.78 mph; Warwick, .021, 6.480 on a 6.470, 103.55 mph, def. Freeman, .031, 5.698 breakout on a 5.700, 117.75 mph. Semifinals – Plott, .005, 4.619 on a 4.590, 146.27 mph, def. Brewer, .030, 4.657 on a 4.640, 147.39 mph; Butcher, .011, 7.227 on a 4.640, 61.73 mph, def. Warwick, .032, 19.371 on a 6.470, 24.21 mph. FINAL – Tommy Plott, Winston-Salem, .007, 8.366 on a 4.610, 54.20 mph, def. Lenny Butcher, Howell, N.J., foul.